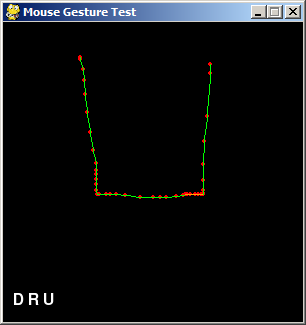 “MooseGesture” is a Python module that implements a basic mouse gesture recognition system. It can identify gestures made up of strokes in the eight cardinal and diagonal directions. 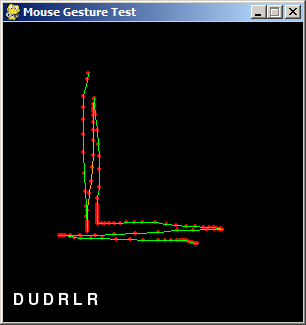 A mouse gesture is holding down the mouse button and moving the mouse cursor in a specific pattern to issue a command. A “point” is a 2D tuple of x, y values. These values can be ints or floats, MooseGesture supports both. A “point pair” is a point and its immediately subsequent point, i.e. two points that are next to each other. A “segment” is two or more ordered points forming a series of lines. A “gesture” is one or more strokes in a specific pattern, e.g. up then right then down then left. The identification of strokes is based on a simple slope calculation between two points. 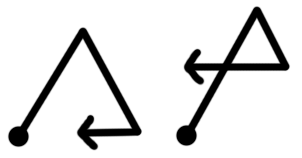 MooseGesture can identify several strokes in a row in the eight cardinal and diagonal directions (up, down, left, right, and the four diagonals in between). MooseGesture does not recognize two strokes in the same direction performed in succession, but sees it as just one stroke in that direction. So up, up, down, down, left, right, left right would be identified as just up, down, left, right. The key is to know when one stroke ends and another begins, and to allow for some inaccuracy and imperfection from the user. MooseGesture does this by breaking up the user’s gesture into overlapping “segments” and testing for a consistent direction on all point pairs in that segment. The user intends to just have a simple to-the-right gesture, but because of some natural shaky mouse movement there is a little deviation in it. We want this deviation to be ignored, and not identified as an additional upright stroke. The segment consistency checks in our algorithm will ignore these little bumps. The last segment will start at the latest point that we can get a segment that meets the minimum segment length. So if the distance between points 7 to 8 to 9 is less than the minimum segment length, there won’t be a segment that starts at point 7 (or, logically, at point 8). Note that the length of a segment is the sum of lengths of its point pairs, not the distance between the first and last points in the segment. For example, the distance between points 0 and 1, 1 and 2, and 2 and 3. It would not be the distance between points 0 and 3. Split up the gesture’s points into segments that meet the minimum segment length. For each segment: Calculate the slope of each point pair and categorize them into one of the eight directions based which “zone” the slope falls in. If all of the point pairs in the segment agree on the direction, then this segment is considered consistent and the direction is added to the list of identified strokes. See the animated gif below for an example of consistent/inconsistent segments, the R stands for “right direction point pair” and the UR for “upright direction point pair”. The list of identified strokes is returned as the identified gesture. This algorithm lets us ignore tiny deviations because they will create an inconsistent segment (i.e. 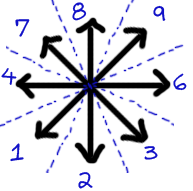 a segment wit pair points going in different directions. So we drop that segment from being considered an identified stroke. But there is bound to be some segments before and after it that are consistent.